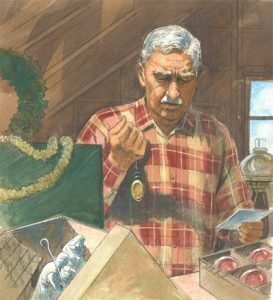 Melea Brock’s serialized character, Ralph Twigger (everyone’s favorite senior citizen), is composite of her grandfather, father and the wisdom and beauty of a generation fading from ours. The Ralph Twigger stories make paths through things as real as grief, love, forgiveness, compassion, friendship, relationship with God. And they also step right into the middle of prejudice, bullying, hypocrisy, romance, singles, growing old and invisible, helping hurting youth, the Church, and much more. That’s reassuring in an age where things come and go quickly. The Ralph Twigger stories have been around since 1993, and they aren’t going anywhere as long as Melea has this character in her imagination. Our hope is to post a Ralph Twigger story monthly. They’ll be here for you to read, and if there’s a recording, you’ll be directed to it on The Ear, here on the website. Ralph would love to serve as a “Dear Abby” for you. We’ll call it ‘Dear Ralphy.’ His wisdom is honest, informative, and a little salty at times. If you have a question about Jeremy or Josh, Debra, about his wife Rachel, any of his stories, or a question about life in general… feel free to ask Ralph. He’d like to answer you. He might have a question or two for you! As I sit in my office alone this Christmas, I heard your story of ‘Ralph Twigger, Innkeeper’ from our local radio and was touched so much by that story, well, it just brought joy into my heart, for that story is my story… and as tears fall upon my cheeks I feel the overwhelming joy of life returning to me. I thank you for your story – you have given me a light of hope that I to can be whole again. Blessed are you with the God-given talent to touch so many. God has given me a present, and it is your story of the Innkeeper. I will now sit with my children and tell them your story so that they will know my heart story.